Recognizes FYROM as "The Republic of Macedonia"
My name is L. and I’ve been a long time fan of your website, DCGreeks.com. I read your articles every week and get important info, like when the next Greek night is taking place. This time, I hope that something a little more serious will get posted on your website. I’m writing you because of the US government deciding to falsely recognize FYROM as Makedonia. Although this is a less known conflict, it is a very important and historical one for Greece. What happened yesterday is very sad and I think it largely happened for two reasons: people are unaware of the subject, and the Greeks aren’t mobilized to act together (either writing letters, making people aware of what’s going on, protests, etc.). I feel that something should definitely be written on your website to inform the Greeks in the area. We are fortunate to live in this area because this is where all the politics and decision-making takes place. By acting together, we will show everyone that this is an important issue for us. Who knows, maybe changes could even be made? If you know of any groups or events that brings Greeks together to discuss/act when something like this happens, please let me know. I hope to see something regarding Makedonia on DCGreeks.com soon. The Star of Vergina, a symbol from Phillip II of Macedon, was included on the original design of the flag of FYROM. FYROM agreed to remove this symbol from its flag before joining the UN. While we could have taken that backhanded compliment in the first paragraph and used it as an excuse to reply with something like "we fail to see where that’s our problem," the writer of this email raises a valid point. To briefly catch those of you up who don’t know what this email is about, for thousands of years and today, the geographic region in the northern part of Greece and to the north of it was known and as Macedonia. As with everything Balkan, the region changed hands and was divided up between several nations throughout the years. A Macedonian province was created as a part of Yugoslavia. For years while they were still a part of Yugoslavia, most people didn’t even notice or care about the name for the region. In 1991 the Former Yugoslav Republic of Macedonia (FYROM) declared its independence from Yugoslavia and, in a messed-up neo-nationalist revisionist sentiment, tried to place the Star of Vergina, a symbol from Phillip II of Macedon, on its flag, thus trying to link themselves to a historical past in Alexander the Great that they could not legitimately claim. (The Slavic descendants of the current residents of that region came on the scene at the earliest about 1000 years after Alexander.) What started making Greeks, particularly in the north of Greece understandably nervous, is that Vergina is in Greece, south of Thessaloniki, pointing to FYROM having territorial aspirations for the part of the geographical region of Macedonia that lies in Greece. 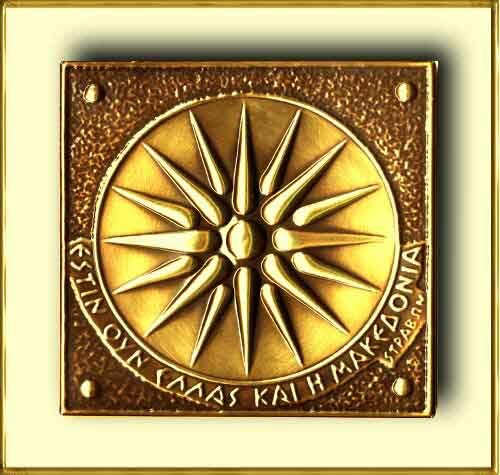 FYROM agreed to remove the Star of Vergina from its flag and was later admitted to the United Nations as FYROM. About 40 individual nations, including Bulgaria, Russia and China had recognized FYROM as the “Republic of Macedonia,” but until last Wednesday, the U.S. was not one of them. While many in the Greek community didn’t realize what was going on, the American Hellenic Institute, a lobby and think-tank based here in DC, was already mobilizing a response. A slew of emails went out over its email list to inform the community and to coordinate it to write the President and their congressmen. You can check out www.ahiworld.org to read these action alerts and follow the latest on this issue. Never heard of the American Hellenic Institute? You’re probably not alone. For all the good work that AHI has done over the years, it remains a traditionally under-funded and under-staffed organization. The only reason that those of us who have heard of the organization know about it is, like the writer of the email said, because we are fortunate to live in this area where all the politics and decision-making takes place. But a DC-based organization can’t do it alone. It needs the power of an organized grassroots movement. The question for us here at DCGreeks.com was, “What can we do about it?” Our theory is that the same people that have enough time to come to this site to find out about the next Greek Night have the time to send an email to their congressman when an issue like this one requires us to act. Let’s face it most of us don’t have the time to go out and make changing this country’s policies and improve US-Greek relations our life’s work. Leave the policy formulation and coordination to those like the American Hellenic Institute who have been on the front lines for years. But when a call to action is raised on those rare occasions, we should do whatever we can. This brings us to the end of our public service announcement. We’ll predictably, and secretly maybe even regrettably, return to our regularly scheduled content on “important” and “serious” matters such as telling you about the next Greek social event or trying to compare dating in the Greek community to a gyro or souvlaki sandwich in the coming days. But rest assured this won’t be our last foray into discussing serious matters and please call us out on it if there is something you think we should be addressing. We’d welcome the feedback and even the criticism.